Before Localist, Explore Gwinnett used a basic calendar that did not offer a lot of the custom elements they wanted, like interactivity and a user-friendly UX. Other custom features were available, but at an additional cost that Explore Gwinnett was not able to afford as a non-profit. 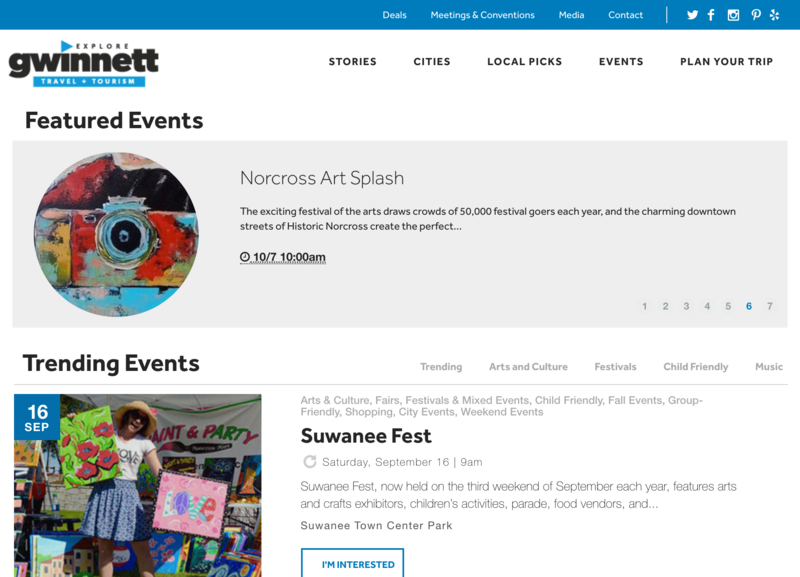 With the launch of their new website in 2015, Explore Gwinnett knew they wanted to maximize the calendar page, which was even at that time the most visited page on their site. As a tourism destination for the local area, they wanted their site to be THE place to go to find events. Key priorities included making sure that their calendar was the most comprehensive one around, with the most information. In choosing a provider, Localist’s expansive calendar was a no-brainer, offering all the features Explore Gwinnett was looking for, and many they hadn’t thought of prior to signing. [We] add thousands of events every year, and previously didn’t have an easy way for people to submit their own events, so having that has been really really beneficial for us. The Localist calendar was more interactive, whereas their previous calendar had not been interactive at all. With the launch of the Localist calendar, Gwinnett’s users could now share events on social media, implement sharing a hashtag with each event, and learn not just about trending events but also about events occurring at their favorite “places.” In addition, partners could now add their own events, a huge help to an organization where uploading thousands of events fell to one or two employees in particular. Ultimately, the decision to sign with Localist came down to the price and wide range of options for Explore Gwinnett. With a comprehensive suite of features offered through the Localist calendar, the Gwinnett team knew that trying to have each of the same features custom built for their organization would take time, money and resources that they couldn’t spare. With the out-of-the-box nature of Localist, everything was ready to go from launch, and the Explore Gwinnett team could immediately get started with marketing their events. In addition, the Localist calendar blended in seamlessly with Gwinnett’s new website, without requiring a heavy lift from their development team or an outside agency. To have something custom-built that offered all the things that Localist offers wouldn’t have been smart financially. We’ve gone that route before with other things, having them custom built, and there’s so many kinks to work out that it takes you so long to get started. But we knew that Localist was already doing it. [We] could transfer the events over and immediately start working on the calendar. Above all else, the team at Explore Gwinnett was impressed with the hands-on service they received from Localist during implementation of the calendar. When Gwinnett’s expectations were misinterpreted or not being met, the Localist team escalated the case and made product adjustments to fit the tourism industry specifically. The result was a calendar that not only met Explore Gwinnett’s needs but also worked seamlessly to draw new visitors to the site and to the destination, all in one effort. The results were exactly what the Explore Gwinnett team had hoped. Events are now very shareable across a wide range of platforms. In addition, visitors can ask questions about events and can see who else is going, create a personal profile and receive reminders about upcoming or relevant events. Explore Gwinnett’s numbers don’t lie, either: since implementing the new calendar, they’ve seen a 350 percent increase in pageviews year over year, a 40 percent increase in time spent in the events section of the site, and an 82 percent increase in site sessions...all metrics that add up to happy visitors and a booming tourist organization. [Localist has] helped increase our website traffic a lot just because it is such a good resource for people to come and look for events. It’s definitely one of the most visited sections of our website. With a planned future expansion to the local convention center, and plenty of out of town tourists looking for a new place to visit, the Explore Gwinnett team continues to direct visitors to calendar so people are always aware of what’s happening at their destination. Their hope is for the calendar to continue to be a great resource and the number one most visited section of the website. New eyes and increased traffic on their event listings will in turn mean new visitors for years to come. Gwinnett is a really suburban destination; we don’t have the mountains, we don’t have the beach. We don’t have any of those geographic things to promote, but we have thousands of events every year, really great, award-winning events. So the events are really one of our big attractors...the events are something that’s always happening. I think it makes us unique. It’s just one of those things that destinations can easily do to promote their area when they might not have a big fancy beach or something geographic to promote. Are you ready to put your destination on the map?